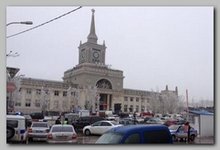 An explosion at a train station in the southern Russian city of Volgograd has killed 17 people on Sunday 12/29/2013, reports say. A female suicide bomber (Black Widow) was thought to be responsible for the blast, Russia’s anti-terrorism committee said. A suspected female suicide bomber killed at least six people when she attacked a bus in the city in October. 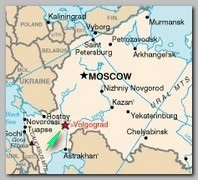 Volgograd, the former World War II iconic Stalingrad, lies about 900km (560 miles) south of Moscow, 650km north of the North Caucasus and 700km north-east of Sochi. Sunday’s explosion rocked Volgograd-1 station at around 12:45 (08:45 GMT) at a time when millions of Russians are travelling to celebrate the New Year. Interfax news agency quoted a source as saying the bomb was detonated near the metal detectors at the station entrance. No group has yet claimed responsibility for the blast, which local officials said claimed at least 18 lives and left dozens more injured. “Initial indications are that the blast was set off by a female suicide bomber,” said the National Anti-Terror Committee said in a statement. A nearby security camera facing the station caught the moment of the blast, showing a bright orange flash behind the station’s main doors. A packed train from Moscow, just minutes away from arriving at the station when the bomb went off, is thought to have been the intended target. In July 2013, Chechen insurgent leader Doku Umarov posted an online video urging militants to use “maximum force” to prevent the Games from going ahead. On Friday 12/27/2013, a car bomb killed three people in the southern Russian city of Pyatigorsk (see also – Pyatigorsk 08.17.10). * The suicide bomber was identified, after few hours, as Oksana Aslanova,26, who was twice married and had lost both husbands in militant attacks. Oksana Aslanova is said to have set off her suicide vest – packed with 20lb of explosive wrapped in nuts, bolts and ball bearings – as police officers approached her. Oksana Aslanova is a Tabasaran national from Turkmenistan, reports Voice of Russia. She is also reportedly connected to Naida Asiyalova, who was involved in an attack in Volgograd, on 10/21/2013, that killed six and injured dozens, reported RT. 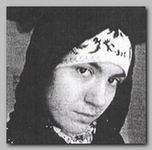 Investigations to establish the whereabouts of Oksana Aslanova has been underway in Daghestan since June of 2012. Oksana Aslanova was reportedly born on 06/16/1987 in Turkmenistan. She later moved to live in Russia’s North Caucasian Republic of Dagestan. She settled in the city of Derbent Street and studied at the Dagestan State Pedagogic University. She married Mansur Velibekov, a Chechen radical and member of the Southern (Yuzhnaya) criminal ring that was wiped in 2008. Upon his death, Velibekov’s widow became a so-called “Sharia wife” of the gang’s leader, Gasan Abdulayev. Another report suggests that Aslanova was also married to a known terrorist, Israpil Validzhanov, who went under the nickname of Amir Hasan. He was eliminated, on 03/18/20118, near the Dagestani village of Tashkapur. There is no information about her since 03/08/2012 it is possible that the so-called “black widow”, who outlived all her husbands, underwent training as a suicide bomber. * The next day, on Monday 12/30/2013 early morning, a second suicide bomber, probably related to Oksana Aslanova, exploded in a trolleybus in Volgograd killing another 14 people, according tothe Russian Interfax news agency. ** Despite the initial identification of Oksana Aslanova as the “Black Widow” suicide bombe rRussia’s National Anti-Terrorist Committee (NAK) named, on Thursday 01/30/2014, Asker Samedov and Suleyman Magomedov as the two suicide bombers in the attacks. Asker Samedov and Suleyman Magomedov were members of a group based in the town of Buynaksk in Dagestan. Two brothers were arrested in Dagestan on Thursday suspected of helping them have been arrested in Dagestan, it added. A video posted online on 19 January by a group calling itself Vilayat Dagestan showed what appear to be the two bombers donning explosive belts and brandishing guns.The NAK said the identities of the dead bombers had been established earlier but not released “for operational reasons”. ** Security forces in Russia’s troubled Dagestan region have shot dead, on 02/05/2014, Dzhamaldin Mirzayev, 30, the suspected organiser of the Volgograd suicide bombings during a house siege. Dzhamaldin Mirzayev died along with another man after opening fire on security forces surrounding the house, Russian security sources say.